Tom Bihn is back for more. After reviewing the Buzz bag by Mr. Bihn (who does personally designs each TB bag), I had to try out another one. This time I traded in the one strap for two. We’re going to put that old saying to the test, “two heads are better than one” (but we’ll be substituting straps for heads). I opened the box and to my surprise, it was 2x bigger than I had imagined. The bag appeared smaller on the website. It is by no means a huge honkin’ bag, I’d rate it at a regular size (2.5 cubic feet? 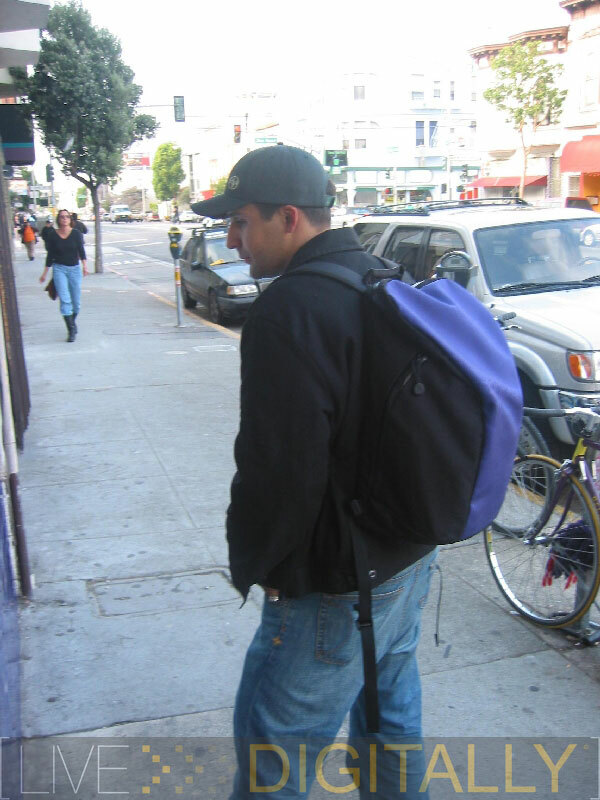 Are backpacks rated in cubic feet?) Purple is the new black, and I keep it real. But I sure don’t have any shoes that will match. Other available colors are crimson, kiwi, sage, and black –I got grape. Enough about the colors, how will Alec, Monolith, and Rebecca (pet name for the iBook I use) get along? The Monolith is Alec’s sidekick, a sleeve type case that protects and houses laptops. 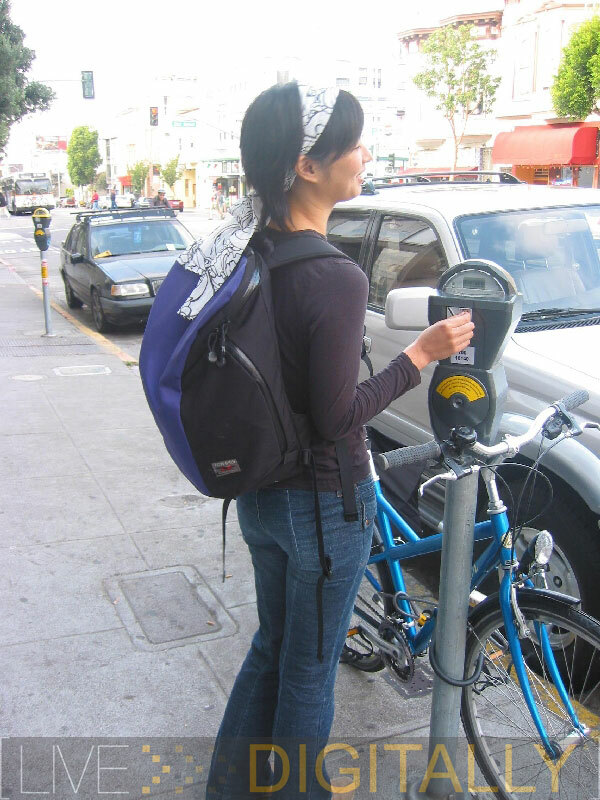 Without the Monolith, Smart Alec is simply a backpack. 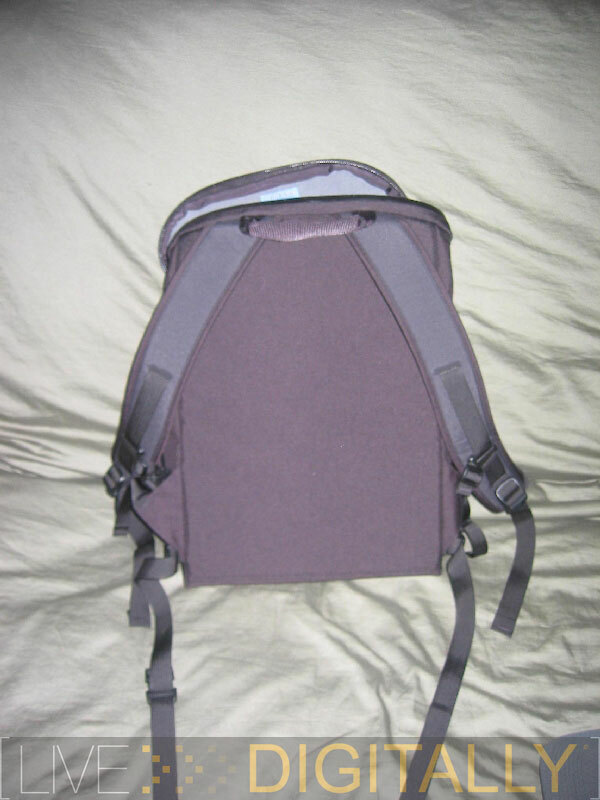 It has two clips that fasten to the interior, keeping a secure handle on the inside of the backpack. 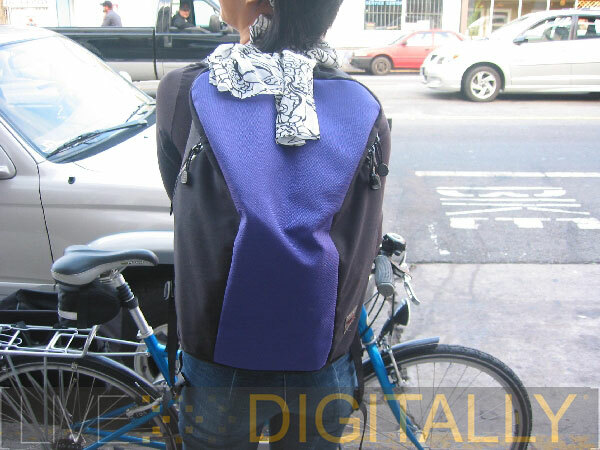 There are ‘D’ clips for a shoulder strap, and two tote style handles. Notice the Monolith’s color is steel and not purple. It comes in the options of: deep blue, crimson, black, steel, and wasabi. With a stiff exterior and a plush interior Rebecca found the Monolith to be a very comfortable and stylish retreat. I noticed the rubber shielded oversized zippers that I am such a big fan of. There are two side pockets that can accommodate quite a bit of peripherals, Rebecca has lots of baggage, so this is good. A 32oz Nalgene bottle easily fit, a must have for any bag I carry. On the inside we have a few sleeve type pockets that can house small items. 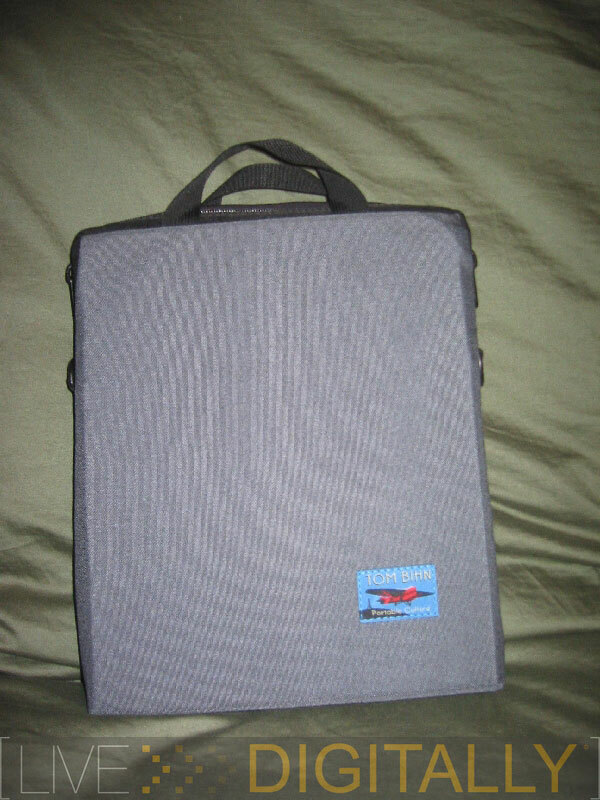 There was no external iPod pouch, which I enjoyed on the Buzz bag. Each day I traveled with this Smart Alec, I found myself pocketing the iPod in my trusty jeans pocket. I could have housed it in one of the side compartments, but that just didn’t seem form fit for the application. I demand for quick song changes. I have to admit, the Smart Alec doesn’t really deserve the name it’s given. There’s nothing ‘Smart’ about it. I found no superneat hidden pockets, or intricately designed cargo space. I’d call it the Simple Alec, or something wittier with the same meaning. The monolith adds some complexity and coolness to the laptop bag, but alone it’s more of a shell than a laptop carrying case. The design is a bit unconventional, and I pondered why Mr. Bihn did this angled top –when it hit me. 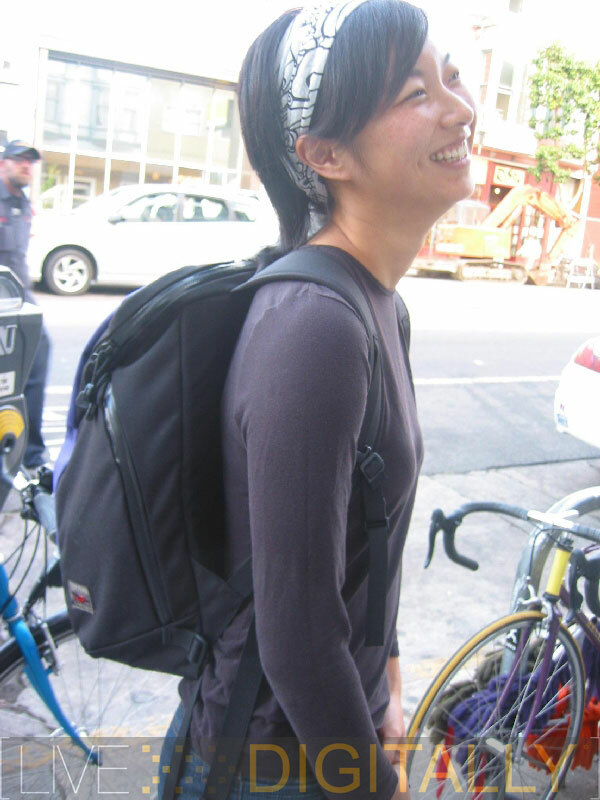 Tom Bihn is based in Seattle. Seattle gets a ton of rain. 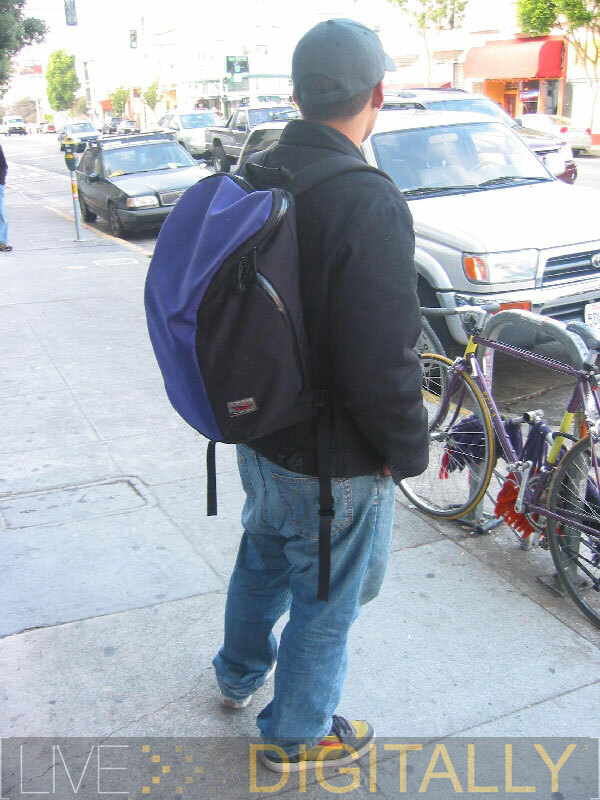 Having an angled backpack top would allow the constantly falling water to run right off the back of the bag, keeping most of the water away from your already soaked sweatshirt (yea, I wear sweatshirts in the rain). My first impression was that the bag appeared much bigger than the photographs depicted. I still was surprised at how well the Smart Alec and Monolith carried weight. My laptop’s entourage consists of: AC power plug, Bluetooth mouse, mouse pad, iPod, iPod 1394 cable, headphones, 256mb pen drive, water bottle, digital camera, and my trusty pen/paper combo. I could carry a few books, a lunch, fork, and an external hard drive. Tomoko wore the bag. This was yet another example of the sheer girth Smart Alec has. She did appreciate the carrying capacity of the bag, but it completely covered her slender frame. She wasn’t happy modeling for the bag. This bag looks much better on myself (5’8” 180lbs). 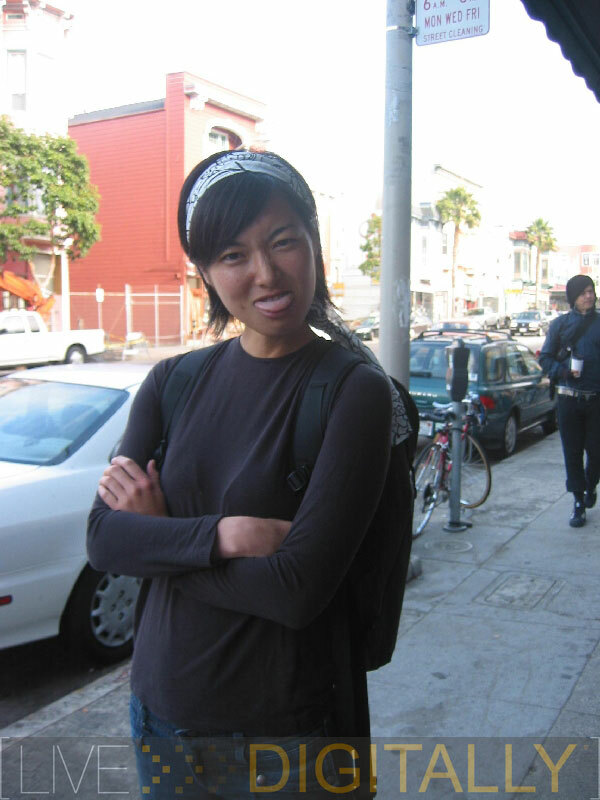 I walked around San Francisco, internet café hopping, with Alec and Mono, and no detrimental effects to my wimpy shoulders. The thin padding in the straps and back were enough to keep me ache free. Let’s see how this Alec performs on the Official LDLCOC. 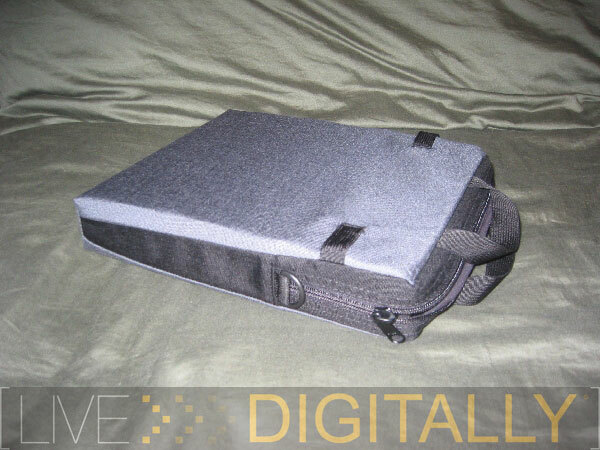 LIVEdigitally Laptop Case Obstacle Course. 2.) The 1 Hour Endurance Test: Very nice, even showboated a bit by carrying more than the test required. 3.) The Water Test: I dumped, Alec laughed. 4.) Function vs. Style: The bag is just too plain looking. It looks almost generic. Function only, no style points awarded. 5.) Female Test: Women liked the color, and the fact that I had my lunch in the bag. Monolith got a few compliments, but in the company of the plain ol’ purple pack, I rolled a snake eyes once again. I didn’t bother asking girls for their numbers this time. Instead I told them to thank Tom Bihn for supporting this review, and that they can get both the Smart Alec and the Monolith in an array of colors at the Tom Bihn website. That is the Barney of all Backpacks I’ve seen.